One of the world’s most active volcanoes may be ready to erupt again. Over the weekend, a crater collapse caused lava to shoot 80 feet into the air from the Kilauea volcano in Hawaii. 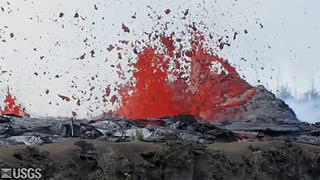 The crater collapse happened Saturday afternoon on the big island of Hawaii and eruptions continued throughout Sunday. As a result of the Pu’u ‘O’o crater collapse, which was at least 377 according to scientists, more than 150 small earthquakes were reported by the United States Geological Survey. Kilauea has been one of the most active volcanoes in the world and has been constantly erupting since 1983. This recent development has scientists on guard for another large eruption. With so many earthquakes affecting the region since the crater’s collapse, scientists are not sure what to expect from the volcano itself. If the earthquakes continue to move the earth beneath the volcano, there is a good chance that the volcano may see another large eruption. Video of the dramatic footage has been captured and can be seen here.